Last year, I wrote about my bird obsession (Birdie Babysitter for Hire) and how I worry about them. 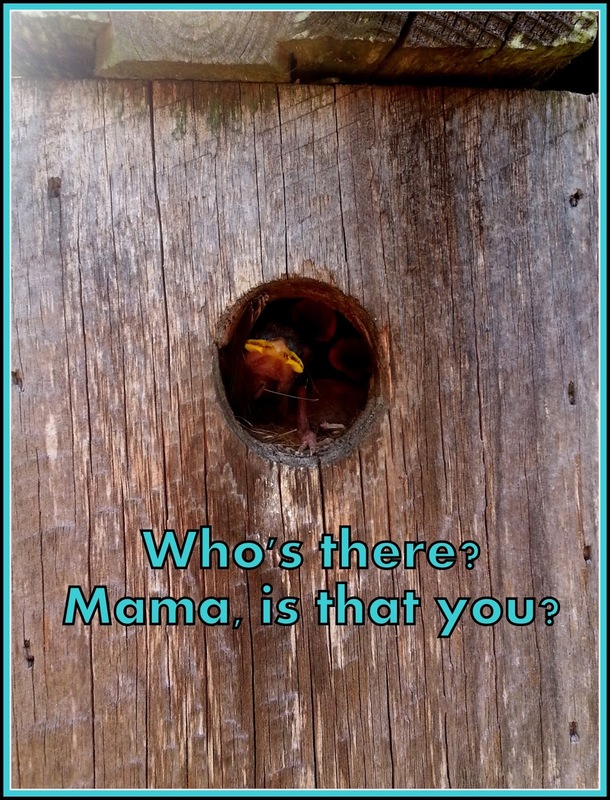 Specifically, I worry about the little baby birds in the nest. Nothing gives me that sick feeling in the pit of my stomach like finding a bird's nest when I know the baby birds weren't done with it. 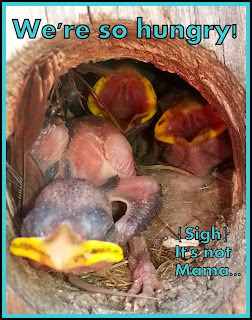 Much to my horror, I'm a studdabubba about the baby birds. Hence, we have many birdhouses in our yard. Daily, I make the rounds and check on their progress. The first batches of Spring had hatched and flown off months ago, but Hubzam discovered new babes in one of the boxes. They poked their heads out as he mowed the lawn and he came in and told me...he's nice like that. I love the birdies. In fact, there they are in the picture above. My basic advice to anyone is leave wild animals in the wild. Don't bug them. I don't follow my own advice, but it's mainly because of one random incident. A few years back, a cold and icy rain was falling. I don' t know what possessed me to go out and look at the bird box closest to the house. Approaching the fence post/box, I just happened to look down and there was a naked, featherless bird. Horrors! It was pretty far from the box, too. Everything you read says not to touch them but this guy was headed for his Maker, no doubt about it. As I walked closer to the bird box, I found two more. These guys were wet and cold, poor things. Throwing chance to the wind (as they say), I held up the hem of my shirt and placed all the birds there. I folded the material over them and gently tried to dry them off. They still looked ice cold and I thought it was too late; it occurred to me that I had nothing to lose. With all the birds in my cupped hands, I breathed on them to warm them up. By this time, I'm also looking around to see if the neighbors are pointing at me and saying, "What the heck?" By removing the top of the bird box, I was able to place them back in the nest but no confidence kicked in. I couldn't see how such fragile creatures would survive. Vowing to check on them daily, I left them alone and watched from inside. Soon, Mama reappeared but I wasn't sure if she'd stay. The only thing I WAS sure of: she would never have gotten those birds back in the nest. They all survived. It's a feathered miracle. Since then, I'm more of a bird helicopter mom than usual with my daily bird rounds. The side affect of this is that the birds frequently cease to be afraid of me. There's nothing I love more than a bunch of birds who come to the opening when I look in the box. Look how young those guys (or girls) are - they don't have any feathers yet. I'll bet they were hungry; just look at the two in back. Unfortunately, I can't help them with that. Good morning, dear Cherdo! I know that you are a kindhearted soul. It doesn't surprise me one bit that you play mother hen and check on the baby birdies around your property. Your story reminds me of two birds that I helped. It was a chilly March day here in Florida and something compelled me to take a walk around our wooded back yard, something I ordinarily would not have done on such a cool and dreary day. 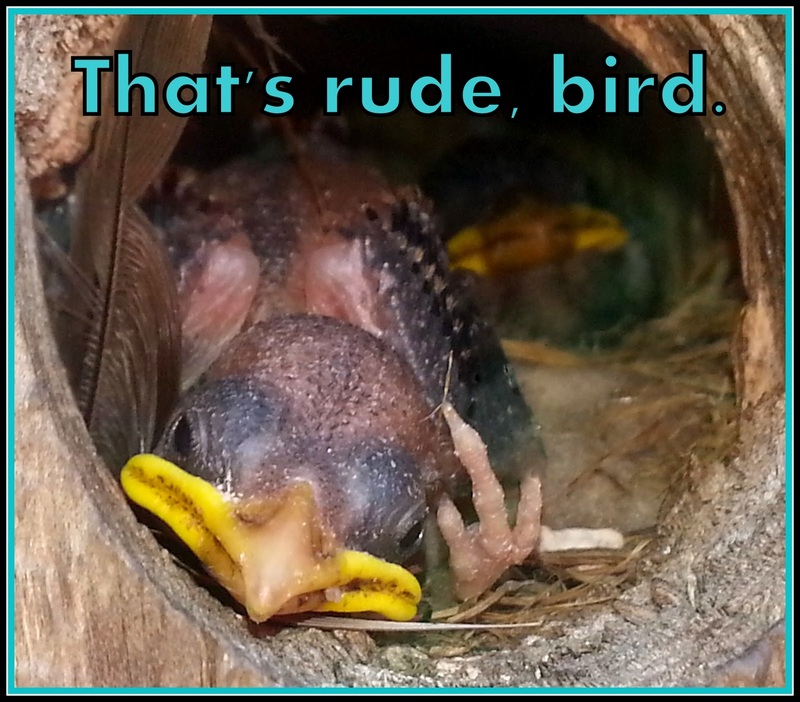 I came upon a tiny, featherless bird that had fallen out of a nest some 8 feet up in a tree. The bird was shivering and I knew that its time was running out. I needed to take immediate action if it was to survive. I got a cloth, gently picked the hatchling up, placed it inside a carton and took it into a spare bedroom. Over the next two days I kept the bird cozy on a towel atop a heating pad and Mrs Shady and I fed it a homemade formula through an eyedropper. On the third day I drove the bird to a rescue facility in another town. A few years later I found an injured crow hobbling around my yard. He had a broken wing and couldn't hunt for food or even jump high enough to get a drink of water out of my birdbath. Mrs. Shady and I punched holes in a large carton, stalked the lame bird, caught him and transported him to that same wildlife shelter. I often think about those two birds and wonder if my efforts allowed them to survive a little longer than they would have. God bless you for caring about small creatures, dear friend Cherdo. Happy Tuesday to you! I love that you and Mrs Shady went through those efforts!! Not surprised at all. Whew! It's 4:30 p.m. and I'm just now checking Ye Olde Blogg. My schedule has flipped and nearly wiped out morning work for amusement. Why have pets when birds are so plentiful? I say that knowing that I get just as much amusement from the cow neighbors...so there ya go. Some weird critter attraction is evident in my life. Coco would like me to have more of it; doubling it daily would please her immensely. It's nearly impossible to keep baby birds alive. One of the toughest wildlife rehabs you can attempt, I hear. 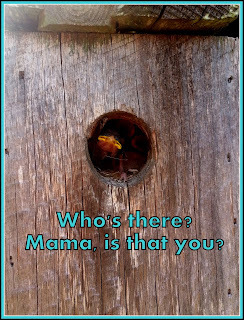 And yet, bird-mama knows how to do it instinctively. Somebody say there's no God so I can twist up my face and give them the "what-are-you-thinking-man" face. There's proof flying around all over. Caring for those tiny things that can't help themselves is another "proof." How could anybody look at a living thing, so tiny and dependent, and say "you're on your own, I've got other things on my plate." Every effort to help something survive is divine; our Maker hotwires us with it. So, a toast to kindness and those who deliver it, Shady! God does bless them with the opportunity to do the good. Have a great day! HOLLI - You're too sweet. You'd do the same things (this is not a "hey look at me" but a "hey look at THEM" kinda vibe, ha ha). Nature is amazing and fascinating. See if you can read my mind. "If I stand at my door with my beak open -- will someone feed me?" "I want a Spanish peanut." "What is the attraction with Telemundo?" Tell the truth...I nailed it, didn't I? More like: If I stand at my door with my beak open, will someone pour in a Bombay martini with two bleu cheese-stuffed olives... and then say, "The first six are on the house"? You were certainly close enough though. What a wonderful post today. I have lots of Quail around my home. And the tiny babies no bigger than a thumb nail are up and out of the nest as soon as they all are hatched. They will find somewhere safer to grow but only a few will survive. I see them running after mum in a line with Dad following. I have put in two ponds for all the birds and others to visit in our hot way to hot summer. When I was raising chickens (no, I didn't eat them), I was reading a poultry catalog and there were all these ads about incubating and breeding quail. Button quail, specifically. I was soooo close to doing that till I found out that they wanted them for hunting. YUCK. I'd rather see them out roaming. I'll bet snakes, coyotes, and cats wait for those poor things. Run, quailie! That's a nice thought, Diana. If the pan-scrubber Angel would please show her face, I have a request. It's true that birds become less fearful with time. I feed birdies, and a mockingbird actually demands that I replenish the suet! Mockingbirds are bold here. Mockingbirds crack me up. They're just BOLD and persistent. I could totally see them demanding food. There's a giant crow I named Poe who hangs around here. He is pretty demanding. I've spoiled him with grapes past their prime. He's rewarded me by going after my tomatoes. Ha! You tickle me. My daughter tried to raise some motherless baby birds. At first it looked like she was going to be successful. Then they started dying one by one. We tried hard to find a person/place to take them. We tried to get help from agencies. But every where we turned they said a baby bird was the hardest animal to hand raise. I've never known anyone who had any success with the motherless wild birds. I was even surprised the ones I placed back in the box made it. Apparently, there's a problem with cowbirds pulling nestlings out so they can use the box for their nest. I think that might have been what happened because they had not been on the ground long and they were pretty far from the nest. Or I forced another bird to raise nestlings that fell out of the Oak. In which case, she did it well. If I were a betting woman, I'd say "cover the chairs." A few years ago when we lived in an apartment, some birds made a nest on my patio in my water pail. I was so excited that they made a home there. I checked in on them everyday and took pictures. 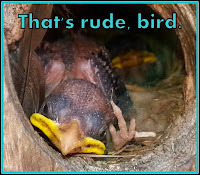 It was so funny because we had a real nice wood birdhouse on our patio but they ignored it. My husband was so baffled why they chose the water pail. The pail was further under our porch and more safer. I said that the birdhouse was too fancy and that our birds were like us, middle class- not fussy. haha! I so love this picture!! When I was young my father spent a lot of money on materials, built a large and elaborate birdhouse and erected it on a tall pole in our back yard. The house was specifically designed to attract Purple Martins. To his dismay, the only birds that ever inhabited it were common sparrows. Apparently, there's a real science to bird box placement. Even the fence posts have to be a certain height range. Some bird feeders (depending on the bird you want to attract) have to be within so many feet of "shelter" -- like a tree. Then, for all the care you take for placement of a bird box, another bird will gladly build in a handing basket or a wreath on a door. Go figure. SHADY: I've always wanted a Purple Martin house but I suspect the same thing would happen. We have a lot of Woods Sparrows and they compete for the blue bird houses. Tons of blue birds in my yard - and Gold Finches! I get them making nests above my apartment balcony, the cats enjoy the comings and goings haha never been given the bird by a bird though. Somewhere out there is a bird who is willing to comply. By the way, Pat, I didn't position that bird hand, ha ha. In fact, I didn't realize it till I was looking through the pictures. How rude! Ha ha ha. I've been told that rescuing little birds who fell out of their nest is futile, but we can't help trying even as the results are heartbreaking. 90% of the time, I think that is true. But all of those birds lived. Rat snakes like to slither up to the bird boxes, too, and I live in the middle of a large field. I'm surprised that ANY birds make it. I've read recently that the 'touching wild things is bad' theory has been proved wrong. Yes, I've heard that, too. Isn't amazing how long people hang on to wives' tales, though? I love birds, too! Whenever we have a yard, I'm likely going to put of feeders and houses. I always grew up hearing that touching baby birds makes the mother reject them, but found out recently that it's not true. If the bird is nearly or completely featherless, it is a nestling and needs more help. First, locate the nest from which the nestling fell. ... If the nest is in a location that you can reach, the best thing to do for a nestling is to place it back in the nest. It’s a common misconception that the human scent lingers on nestlings and deters parents from caring for it. In fact, birds have a notoriously weak sense of smell and generally rely on sight and sound for information about local threats." Ha ha ha! I'm Madilyn approved and no one can stop me now! Actually, his eyes were open they are just on the sides of his head so you can't tell till he turns sideways. I'm a softie and would have done the same thing. I couldn't just leave them to die. If you pay attention to them, it's addictive. This may be something I completely imagined, but I'll say it as if it's fact - I heard that a mother bird can usually tell when her kids have been messed with and will abandon them then-and-there. That's what I was always told, too! But personal experienced has proved otherwise. All three of the birds I warmed and dried off lived and Mama Bird didn't seem to mind. BUT if I would have tackled that job myself (feeding, etc. ), I had little chance of success. Oh I love animals and I think your story is sweet how you saved them. I thought you would have ended that they all died because your smell was on them but thankfully I was wrong. I have a feeling these birds were not happy with you because you did not bring any juicy worms.